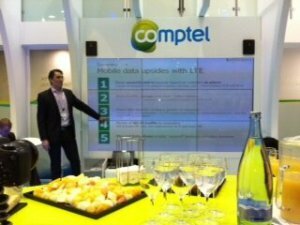 Preparing analysis and facilitating workshops on 4G LTE and fibre adoptionwith over 40 of Comptel’s operator customers from around the world as part of Comptel’s Focus Group in Helsinki 25-26 March 2014. 2013 ended with over 1 billion smartphones sold – a new record. But mature market operators should look at Korea as a projection of what will come: It is the world’s most advanced LTE market based on penetration and usage levels. 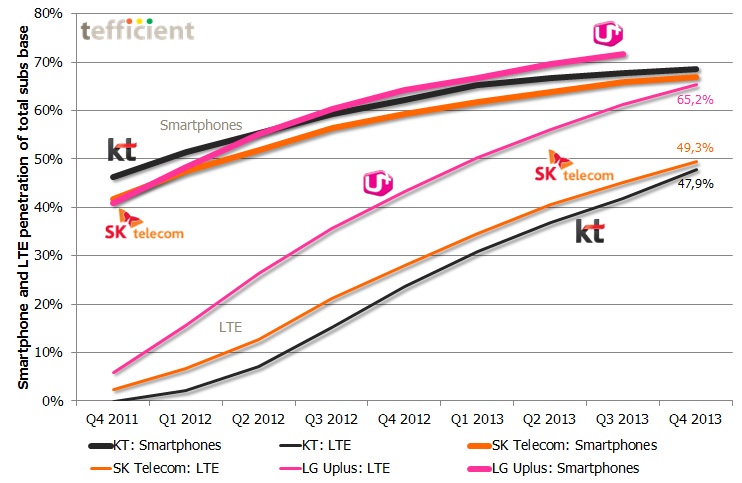 The operators in Korea – SK Telecom, KT and LG Uplus – are continuing to sell a lot of LTE equipment to its customers, even though sales slowed somewhat during 2013. But whereas the sales of LTE equipment earlier led to a lift in overall smartphone penetration, it looks as if it’s not going to drive smartphone penetration very much longer: See how the three top curves in the graph slow down even though the LTE curves go up. Note: LG Uplus hasn’t yet stated overall smartphone penetration for Q4 2013. Non-LTE smartphones are soon phased out of LG Uplus. In the world’s most advanced LTE market, LTE seems to run out of fuel. Existing smartphone customers do upgrade to LTE smartphones, but the overall smartphone penetration in Korea doesn’t climb above 70% [SK Telecom holds 50% of market, KT 30% and Uplus 20%]. If we extrapolate, the LTE penetration will equal the smartphone penetration during 2014 – more or less. For mature market operators believing in LTE’s ability to take smartphone penetration levels beyond the 70% level observed today in countries like e.g. Sweden, Norway, the Netherlands, Australia, the UK and France this is bad news. The Korean development indicates that LTE as such is not enough. The situation resembles 2007 – before the arrival of the iPhone. Incremental improvements had made products from e.g. Nokia the best ever, but disruption was needed to create new growth. iPhone was the catalyst in 2007. The mobile world – including Apple – are back into incremental improvements and the current products are the best ever. From where will the innovation come that creates new growth in mature markets? 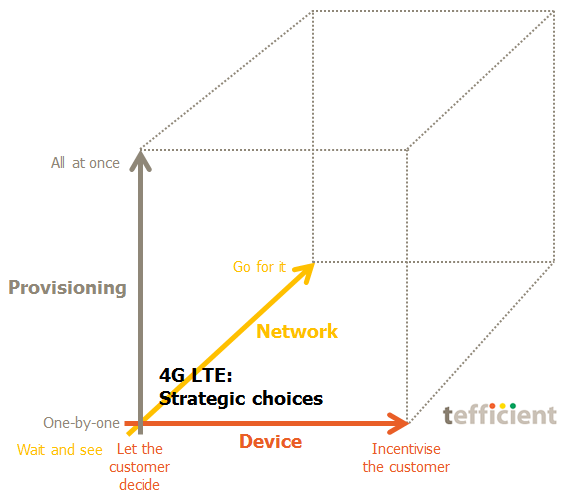 Examining the strategic choices of operators: At tefficient, we’ve been having our ears to the ground for some time picking up and summarising operator data on how 4G LTE adoption is developing globally. An absolute majority of operators who have launched 4G LTE still fail to report their 4G LTE customer number, their 4G LTE device penetration and their 4G LTE traffic level – but it’s on its way up. And for those that do report, the third quarter of 2013 represents a shift: No longer is 4G LTE a niche service for a few early adopters – instead it is mainstream. At least in parts of the world. Three criteria need to be fulfilled to be able to count a user as a 4G LTE user. This analysis introduces the 4G LTE cube which visualises the strategic choices operators have when it comes to all three. So far, strategies differ very much – and they affect adoption strongly. Analysis of operator business upsides and downsides when launching 4G LTE. Commissioned by Comptel. 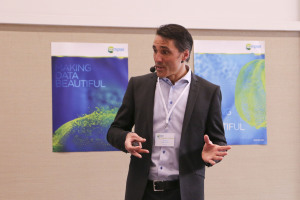 Live presentation of an extract of the analysis, titled “Pinpoint the right customers: LTE handsets in wrong hands will dilute margin” to Comptel’s customers at two occasions during MWC in Barcelona. A special analysis, commissioned by Comptel was launched shortly after.